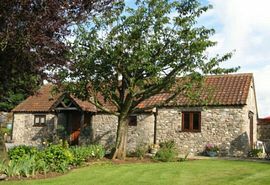 The holiday cottage dates back to the 15th century and was originally part of Church Farm, it has been lovingly refurbished by the owners. It now provides exceptionally spacious holiday accommodation with much character ensuring your stay is relaxing and memorable. The cottage has one bedroom to sleep two guests but also offers a high quality sofa-bed in the sitting room which can accommodate a further two guests or visitors. The furnishings are of a traditional style which combined with modern facilities, ensures a high level of comfort during your stay. Positioned in a peaceful setting, guests can enjoy a beautiful walled cottage garden which provides the perfect place to relax or enjoy eating alfresco whilst taking in the lovely views and watching the wildlife. This is the perfect country retreat to get away from the pressures of every day life and explore this beautiful corner of the West Country of England. Bath and Bristol are only 13 miles away and the ancient cathedral city of Wells is just 5 miles, with its interesting shops and a good selection of restaurants. Nearby attractions include fantastic Cheddar Gorge, mystical Glastonbury, Longleat Safari Park and the Bath & West Showground. The accommodation is bright and exceptionally spacious and has been designed to provide modern conveniences in a traditional setting. Many traditional features have been incorporated such as exposed beams throughout, an oak framed wall and old pine and flagstone floors. The accommodation is on one level providing easy walking access. Sitting Room which has double doors leading to a secluded patio. This lovely spacious room is cool and airy in the summer months and the perfect place to relax in front of the log burner on those more chilly winter evenings, watching the flames flicker. It also benefits from 'freeview' television, WiFi Internet access, DVD player and a hi-fi with CD player. The comfortable sofa bed, with sprung mattress, provides additional sleeping facilities for two short stay visitors. 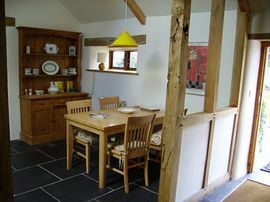 The Kitchen, with views across the field, is equipped to a high standard offering ceramic hob and fan oven, dishwasher, large fridge/freezer, microwave and washing machine. The use of a tumble dryer is available upon request. The spacious dining area has a large pine table and seating for four. Bedroom. 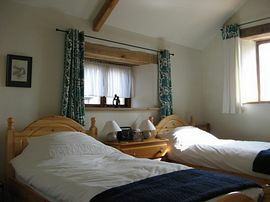 A twin bedded room with feather/down duvets, cotton bed linen, pillows and bedspreads. Here a second television and radio are provided and there is plenty of hanging and storage space. Shower Room. This has a luxurious spacious shower area with power shower together with a washbasin, toilet and bidet. Additional information: Unfortunately the holiday cottage is not suitable for children under 12 years of age nor for pets. The cottage is non-smoking. Bed linen, towels and electricity are included within the price; central heating is included between 1st October and 8th April. Visit our website for many more images and up-to-date availability. Particularly spacious beamed barn with character features. In delightful walled cottage garden for your exclusive use. Easy walking and wheelchair access. Pillows, duvets, bedspread, bed linen and towels are provided. 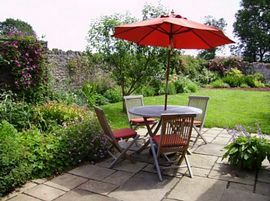 The delightful walled cottage garden is a particular feature and is exclusively for the enjoyment of our guests. Local Services: Bus stop, on Bath to/from Wells route, is 500 metres. Service approx hourly. Village of Binegar is 4 miles north of Wells, signed off B3139. At Binegar green crossroads, turn left on to Turners Court Lane, after 300 metres turn right to Church Farm and Beanacre Barn. Low Season: £300 - £340. Mid Season: £350 - £430. Available for periods of weeks or short breaks. Full details, availability and special offers on the website. "What a delightful spot. The Barn is gorgeous and as for the garden . . . . !" C & B, Essex. August 2007. "We have really enjoyed sitting out in your beautiful garden watching the pheasants, wild birds and the visiting cows at the gate." J & C. Newcastle upon Tyne. "One of the best cottages we have stayed in. Very comfortable and has everything anyone could need." P & T, West Sussex. August 2007. "The Barn is a beautifully crafted conversion and we both enjoyed its comfort and space. Its geographical position makes it the ideal centre for sightseeing in the mid-west." G & L, Kent. September 2006.